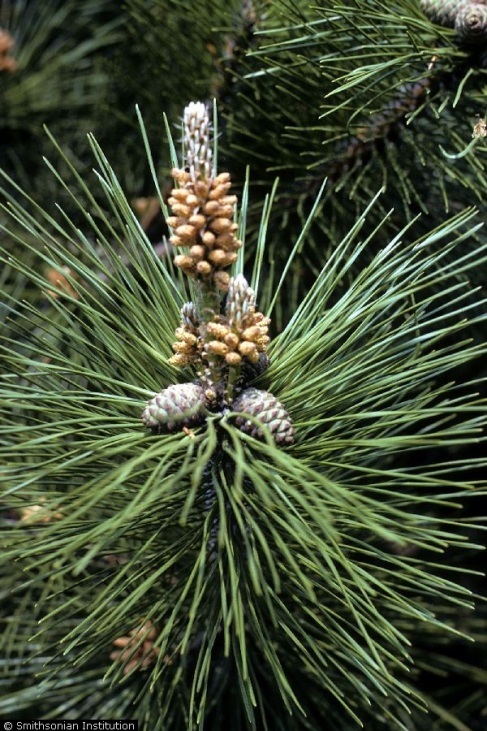 Pinus thunbergiana.Courtesy of Smithsonian Institute.R.A. Howard, hosted by the USDA-NRCS PLANTS Database. (Accessed 8/2014). Pinus thunbergiana is an evergreen gymnosperm tree to 30 m, usually irregular in form branches often somewhat drooping, bark flaky-fissured, blackish, winter buds grayish-white, cylindrical, ca 1.5 cm, scales appressed, fringed, not resinous. Leaves needle-like in bundles of two, 6-11 cm long, dark, glossy green, tip sharp-pointed, twisted, margins finely toothed, lines on each surface, sheath 1 cm, ending in 2 long, thread-like segments, densely crowded at ends of twigs, living for 3-5 years. Flowers: None. Gymnosperm. Monoecious; male cones yellow, deciduous; cones 4-6 cm, egg to cone-shaped, short-stalked, maturing in two years (Dirr 1990; Rehder 1968). Habitat: Planted and escaped, sometimes locally dominant in dry, sandy coastal soils pH 5.5-8 (USDA, NRCS 2010) especially in Gateway National Recreation Area. Notes: Susceptible to a disease associated with the black turpentine beetle (Dendroctonus terebrans).